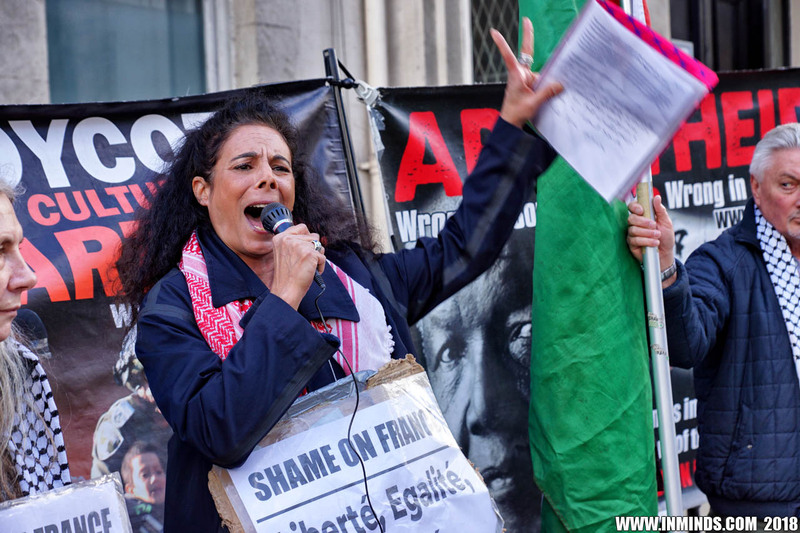 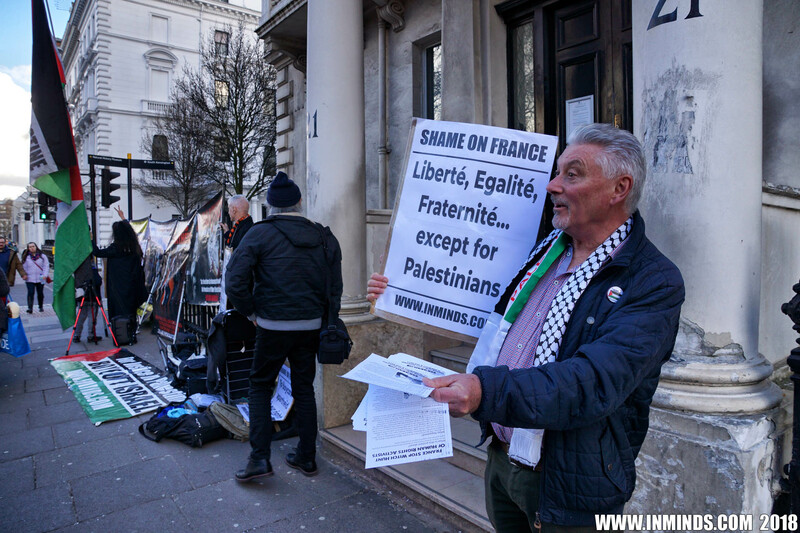 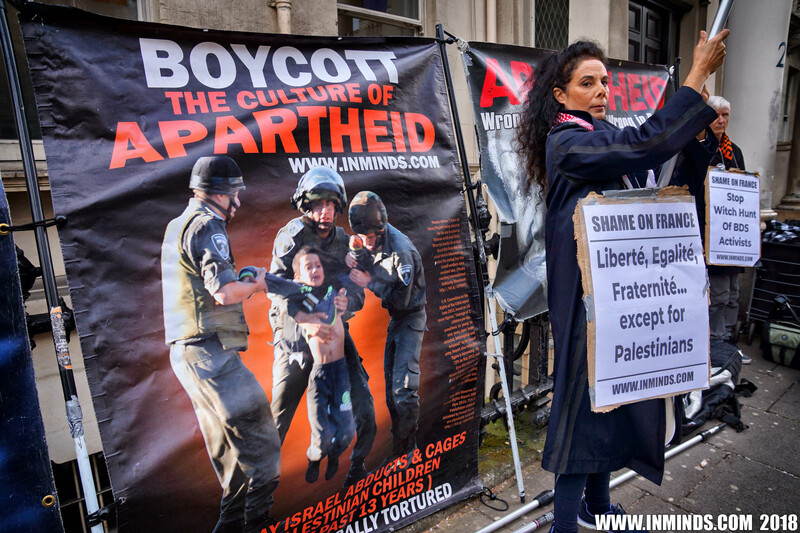 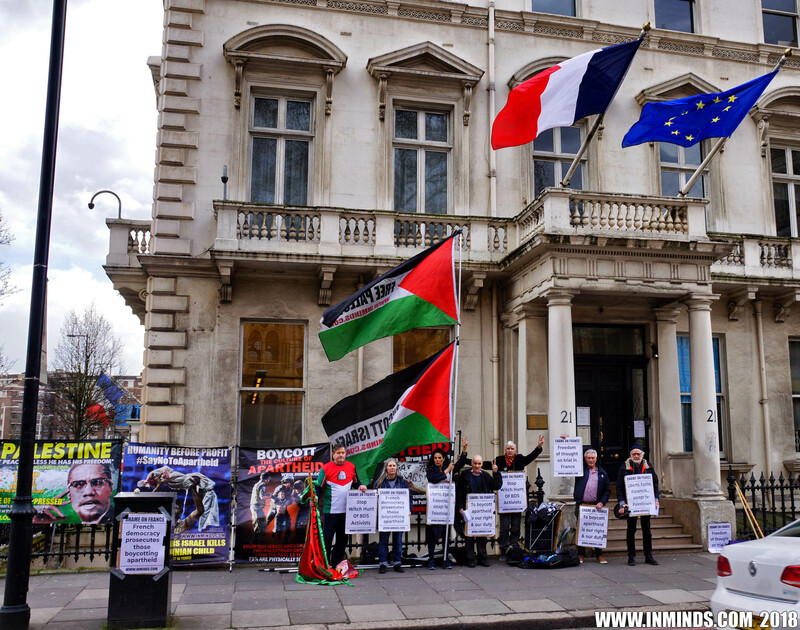 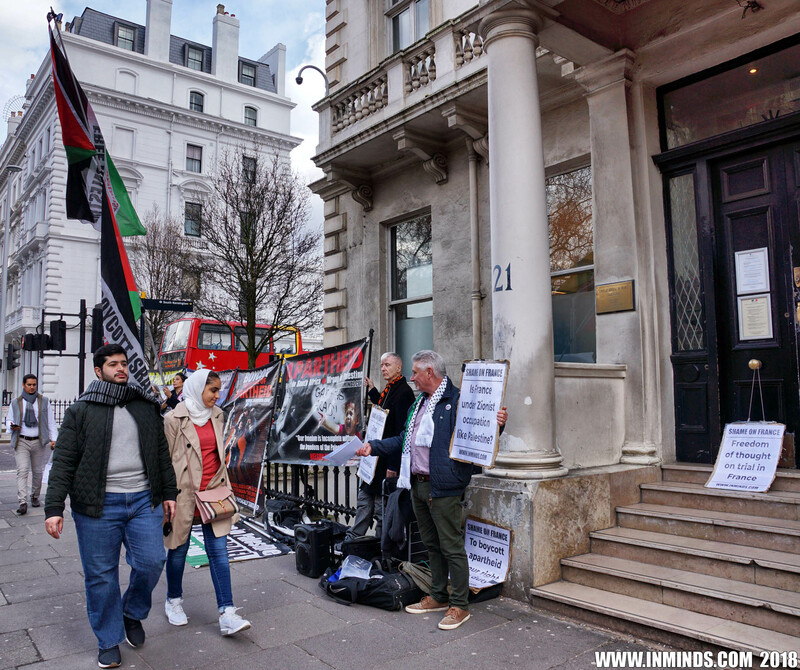 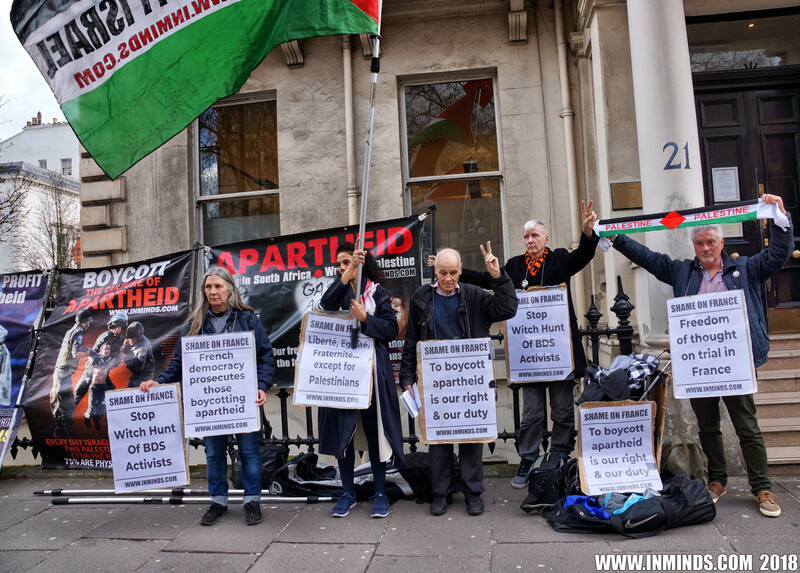 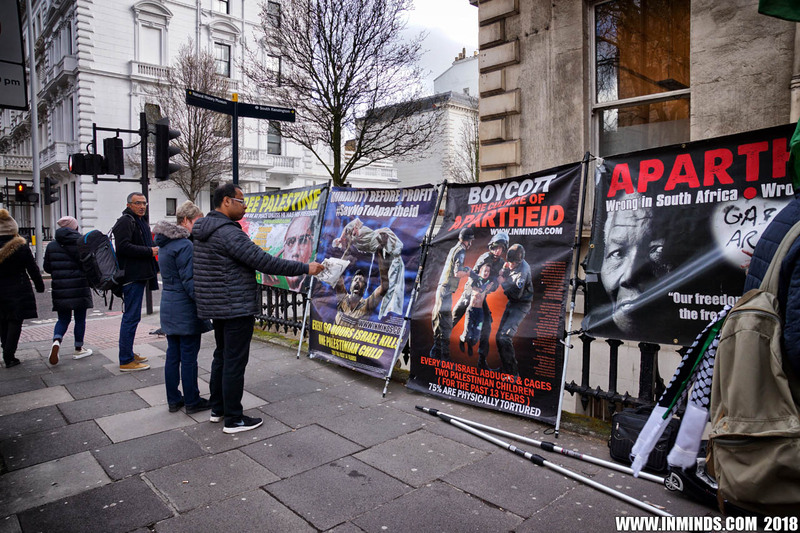 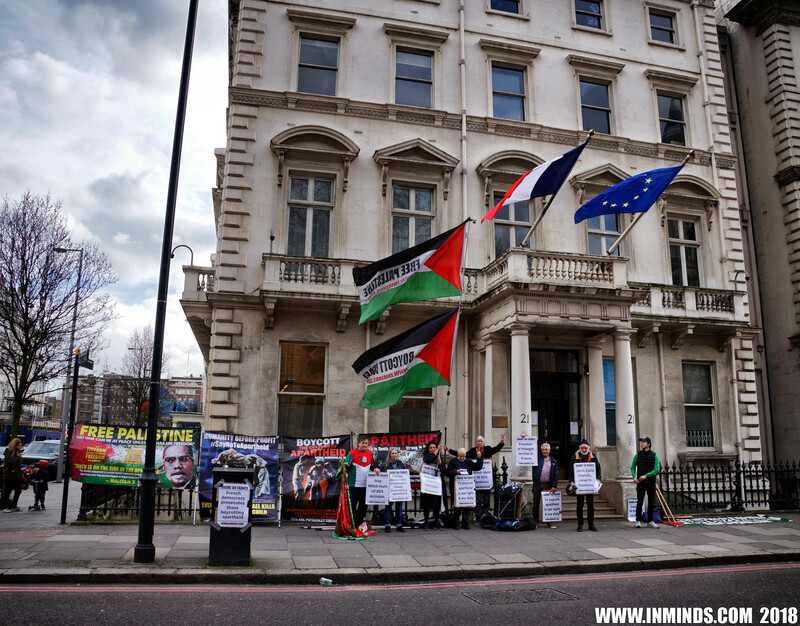 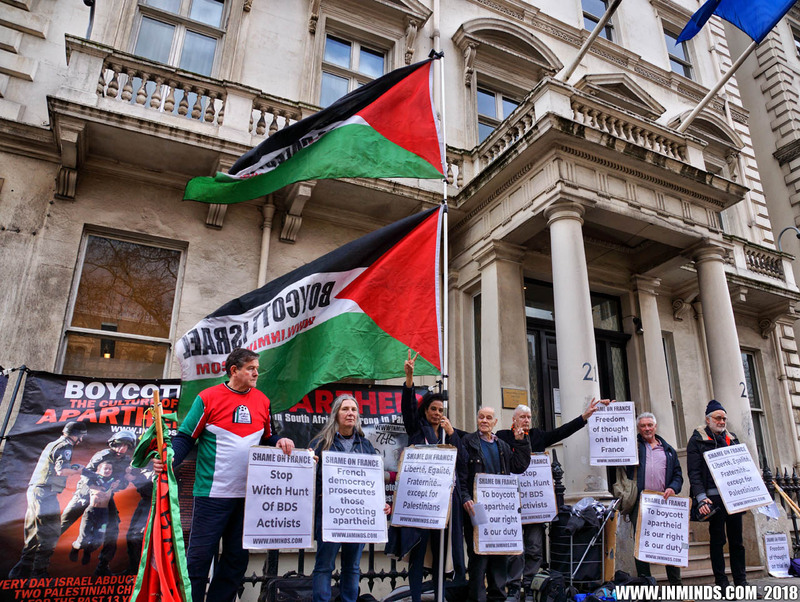 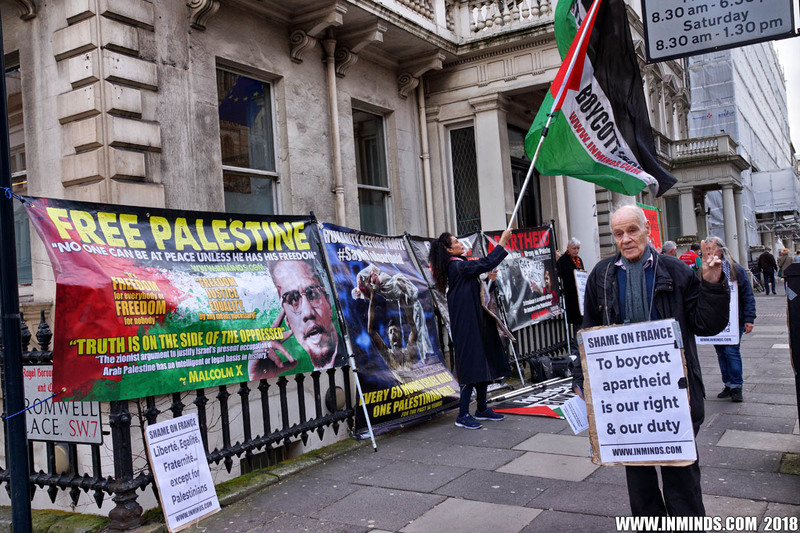 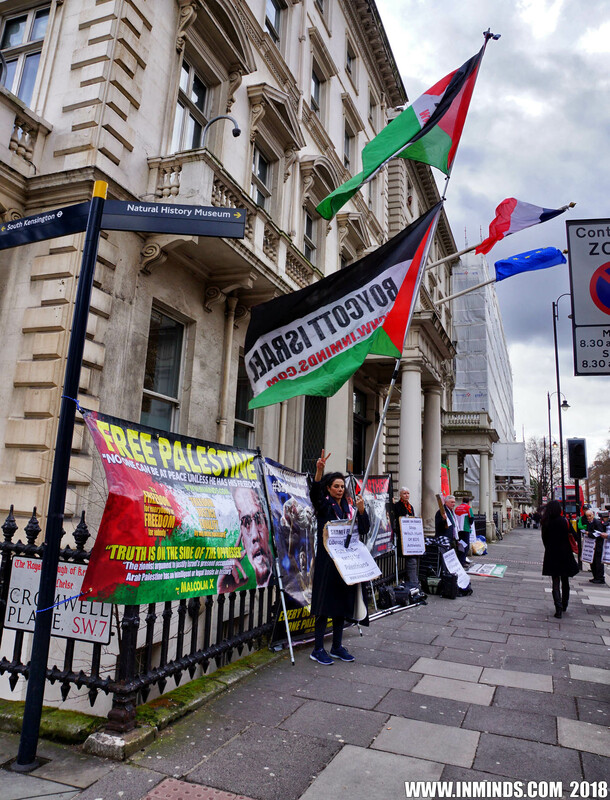 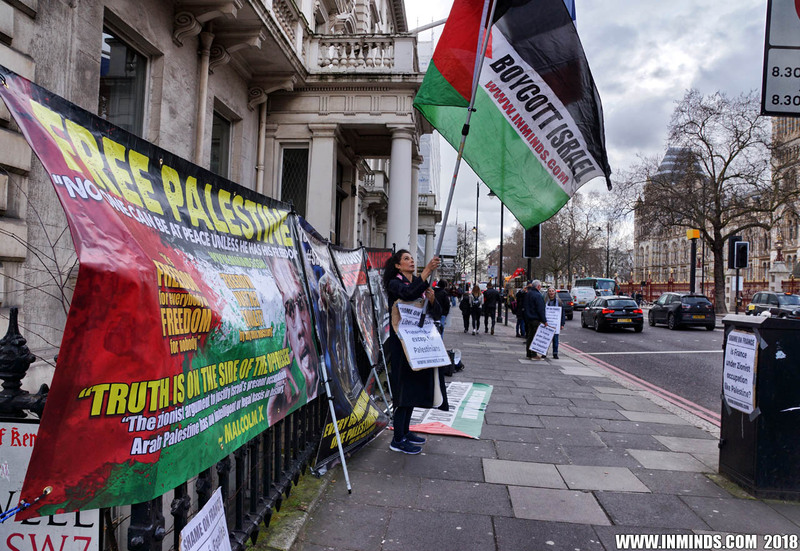 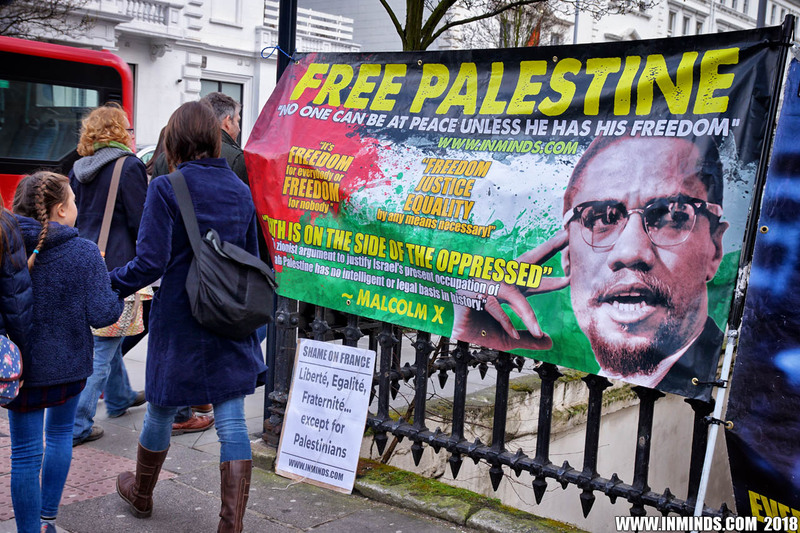 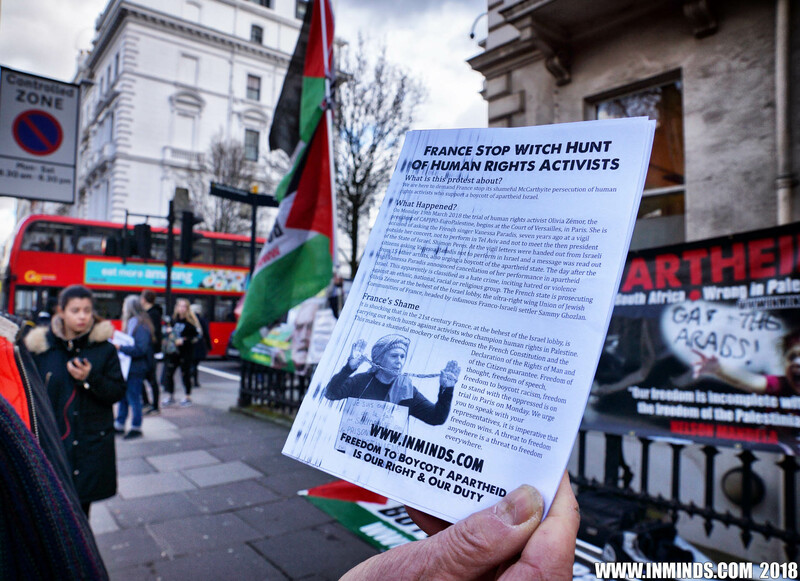 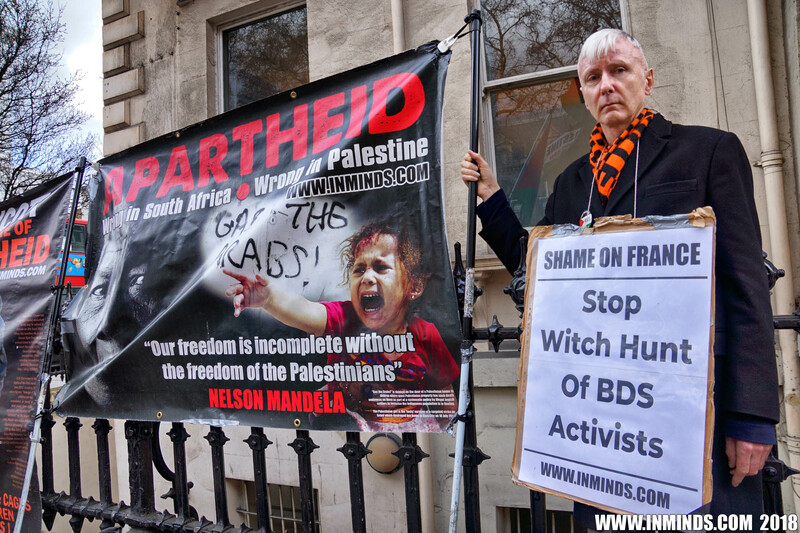 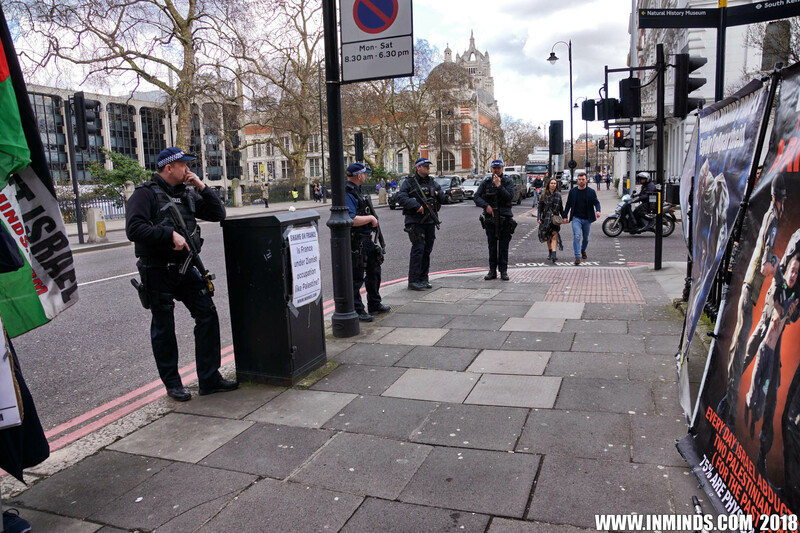 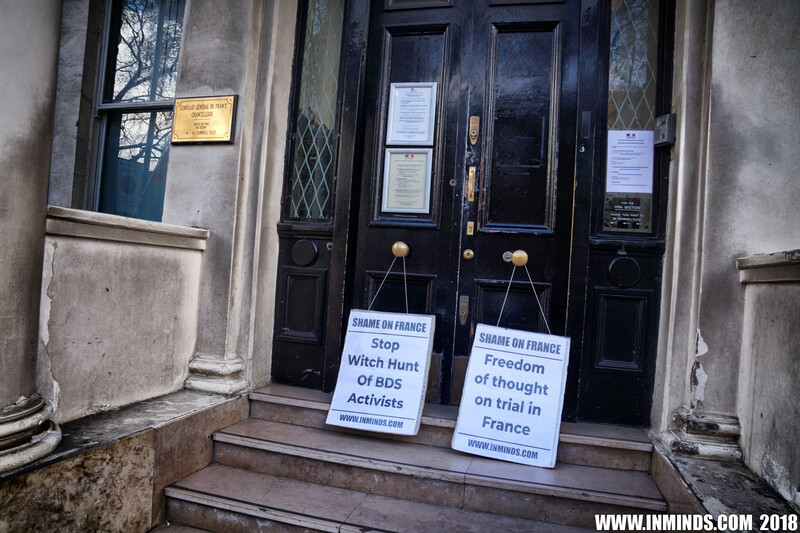 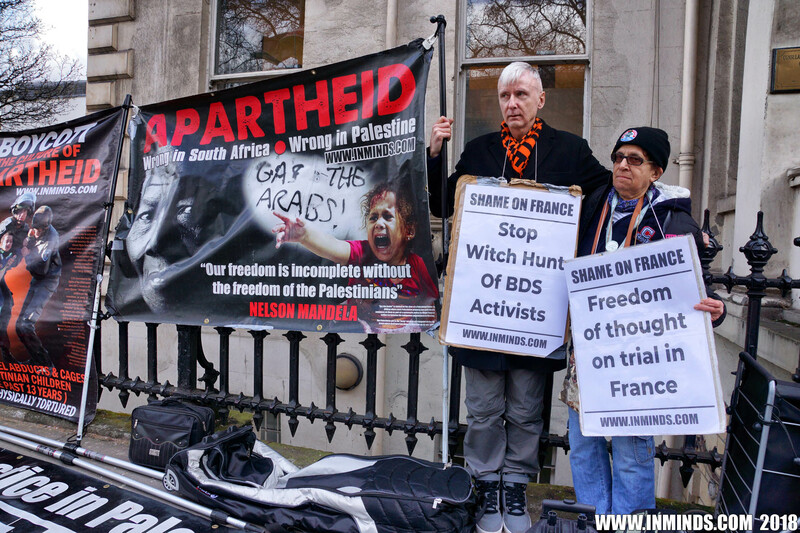 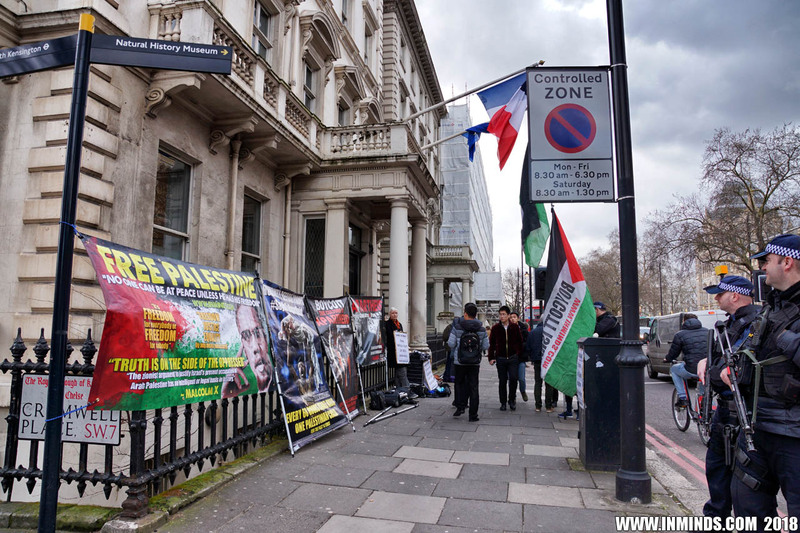 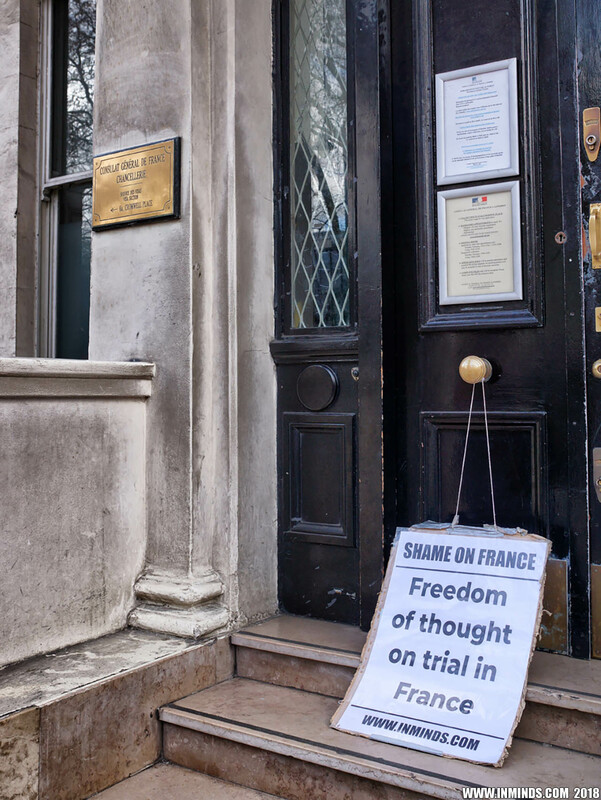 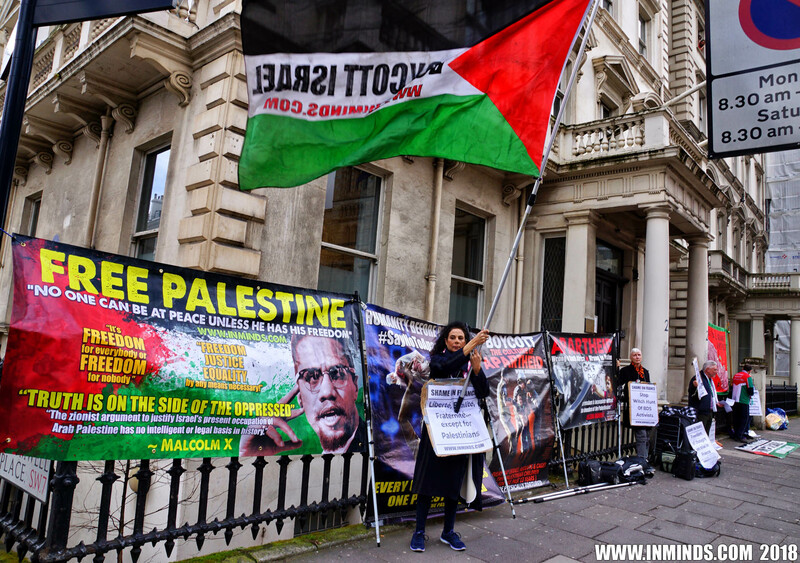 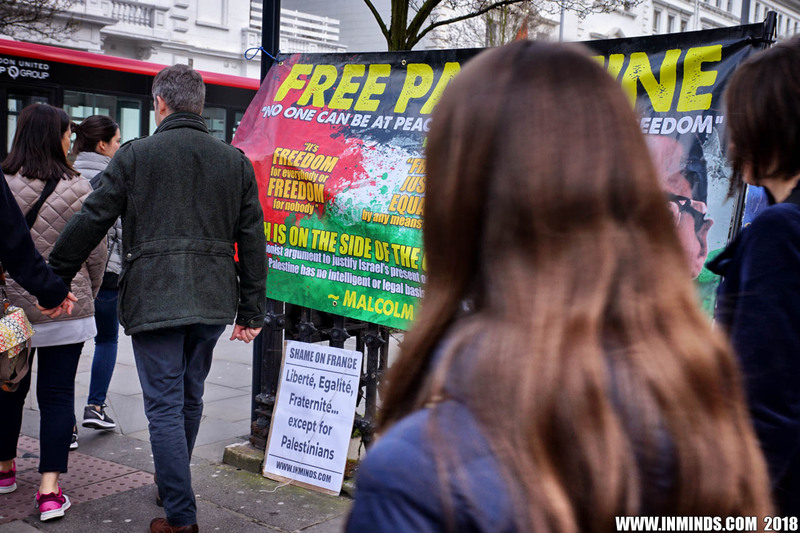 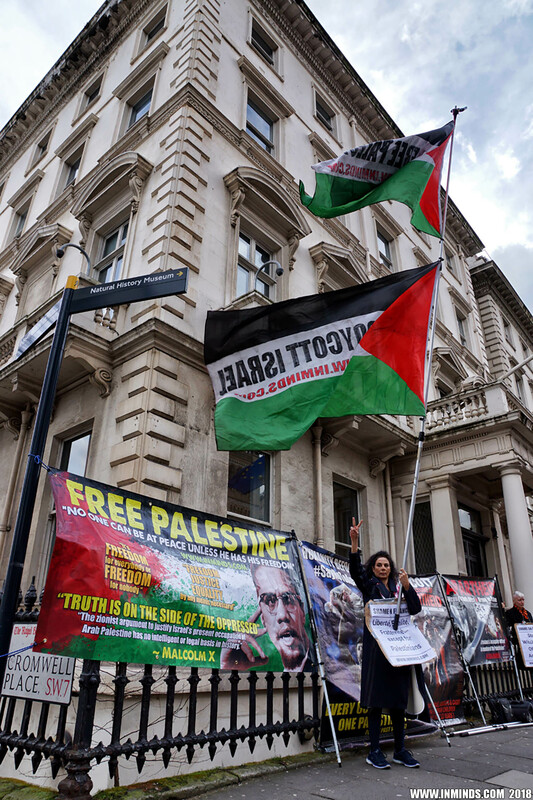 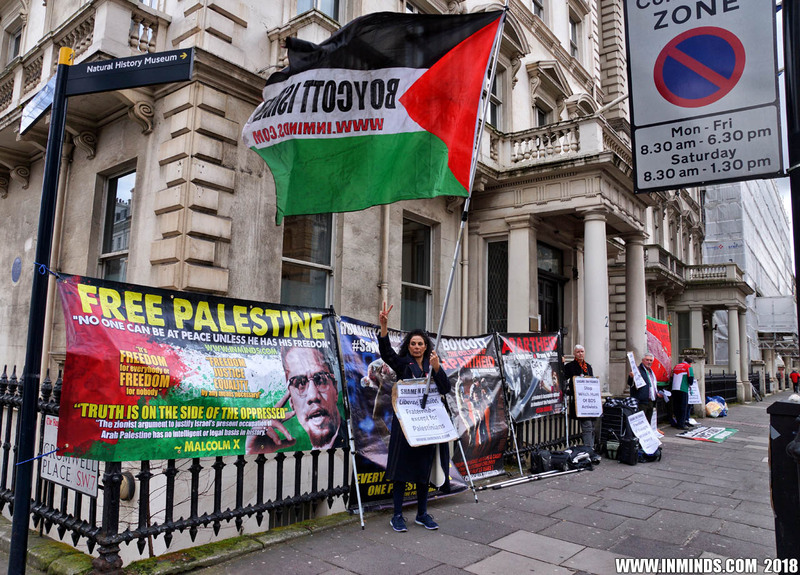 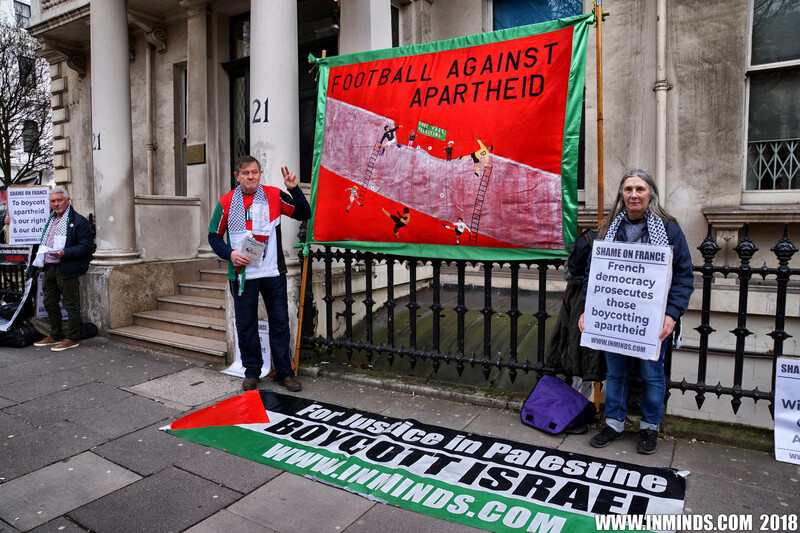 On Friday 16th March 2018, Inminds Human Rights Group protested outside the French Consulate in London to demand France stop its shameful McCarthyite persecution of activists who support a boycott of apartheid Israel. On Monday 19th March the trial of human rights activist Olivia Zémor, the president of CAPJPO-EuroPalestine, begins at the Court of Versailles, in Paris. 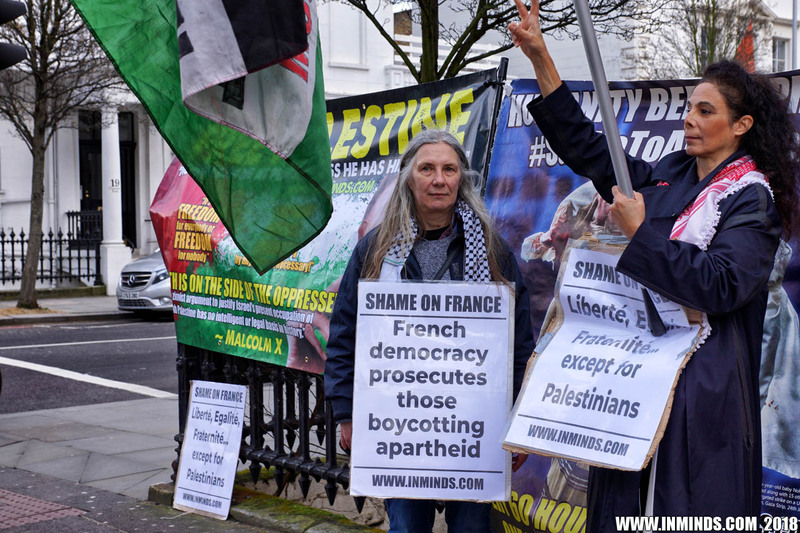 She is accused of asking the French singer Vanessa Paradis, seven years ago at a vigil outside her concert, not to perform in Tel Aviv and not to meet the then president of the State of Israel, Shimon Peres. 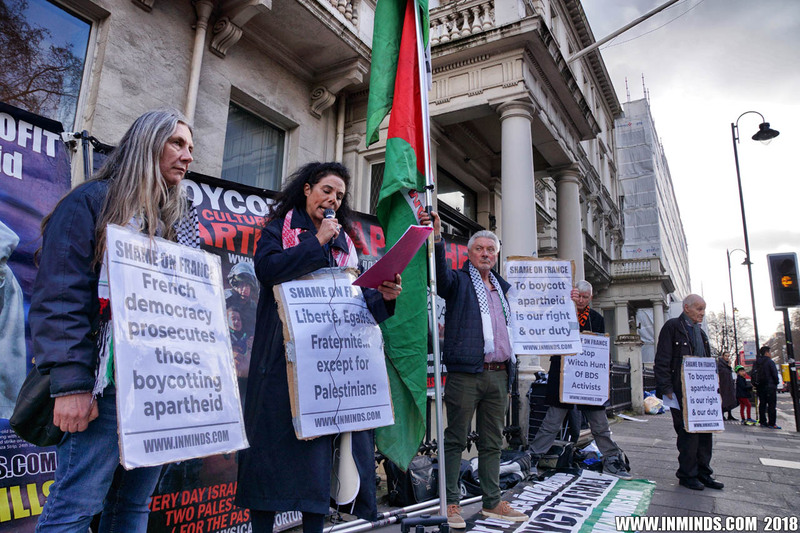 At the vigil activists handed out letters from Israeli citizens supporting Palestinian human rights, appealing to Vanessa Paradis not to perform in Israel and a message was read out from 15 other artists, also urging a boycott of the apartheid state. The day after the vigil Vanessa Paradis announced cancellation of her performance in apartheid Israel. 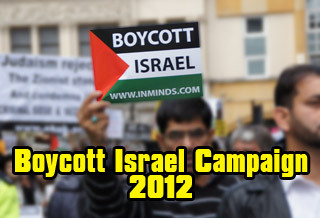 This apparently is classified as a hate crime. 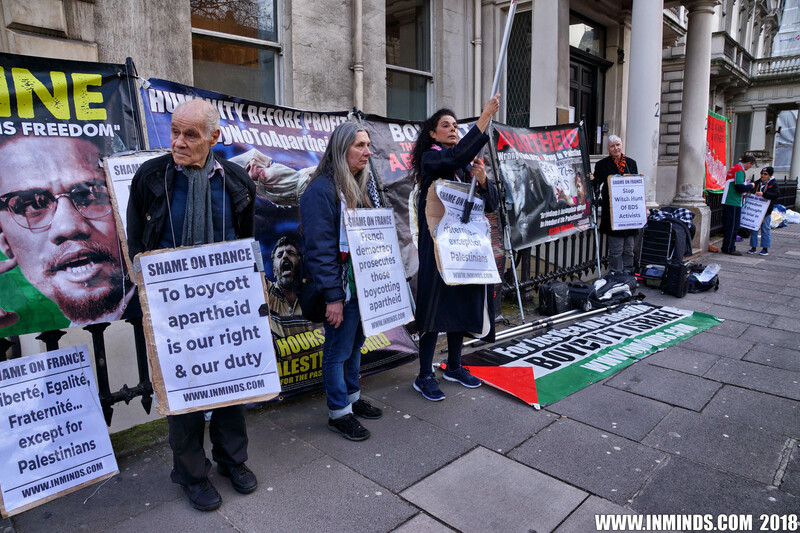 Her vigil asking Vanessa Paradis to support the Palestinian call for a cultural boycott of apartheid Israel is interpreted as inciting hatred or violence against an ethnic, national, racial or religious group. 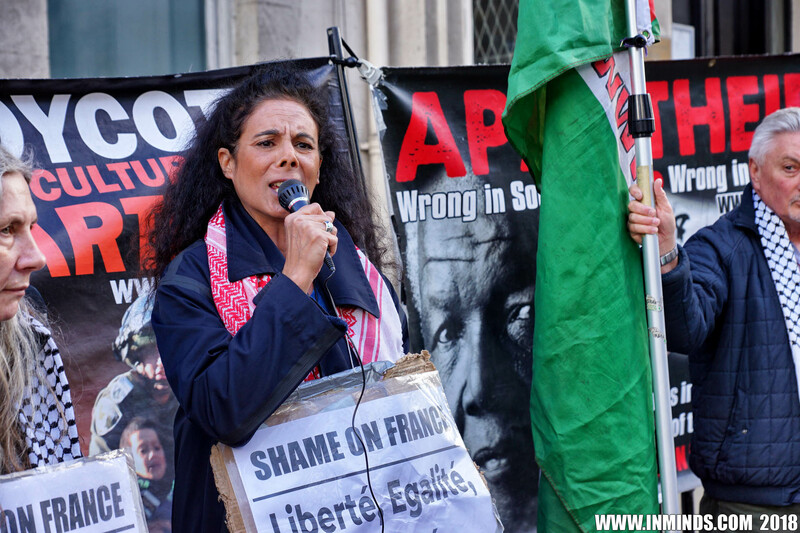 The French state is prosecuting Olivia Zémor at the behest of the Israel lobby, the ultra-right wing 'Union of Jewish Communities of France', headed by the infamous Franco-Israeli settler Sammy Ghozlan. This is not the first time the French state has done the bidding of the Israel lobby in bringing such spurious prosecutions of human rights activists. 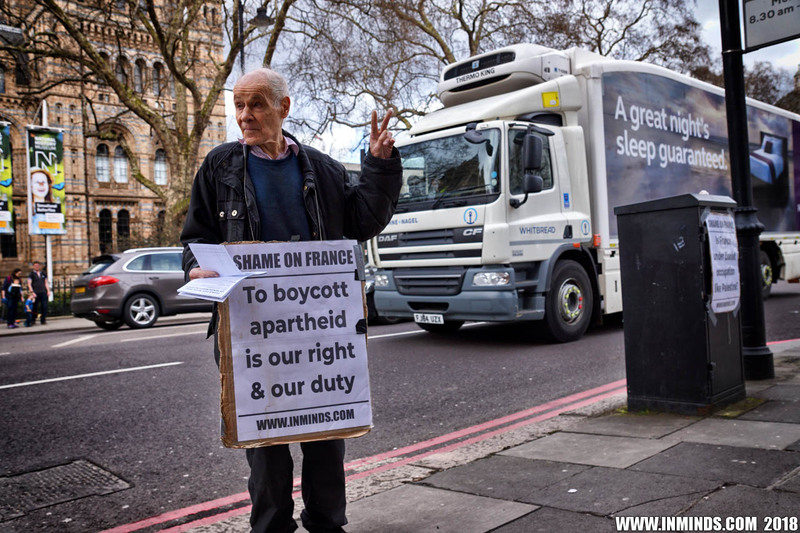 Previously activists were put on trial for urging shoppers in a supermarket to boycott Israeli goods. 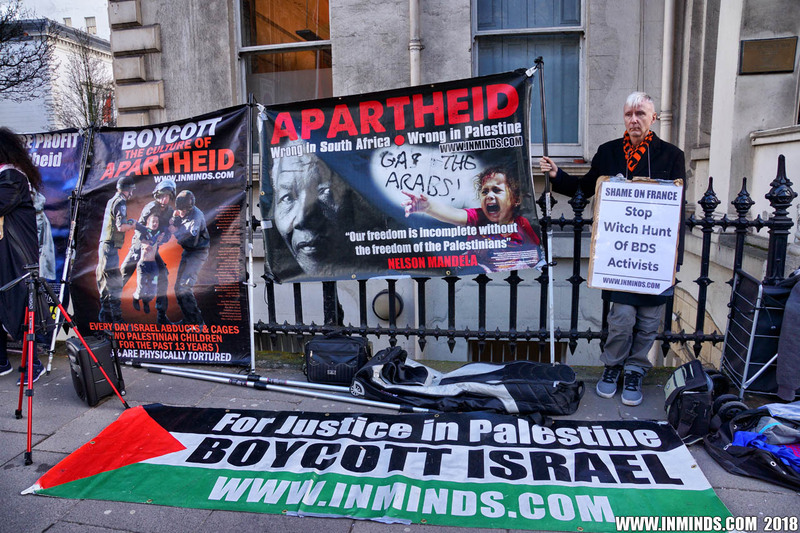 That state prosecution failed, with the judge ruling that boycotting Israel is not a hate crime. 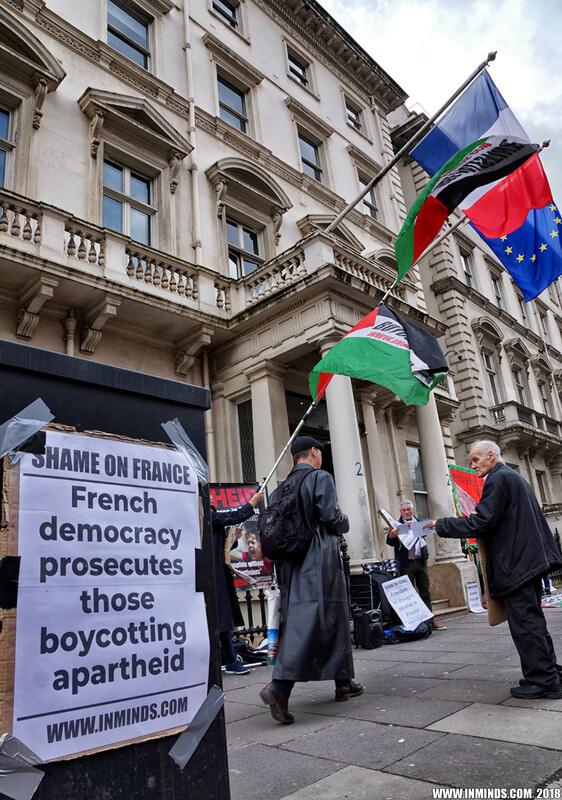 But French law is such that even when the state loses the case, it does not reimburse the expenses incurred by the people it attacked. 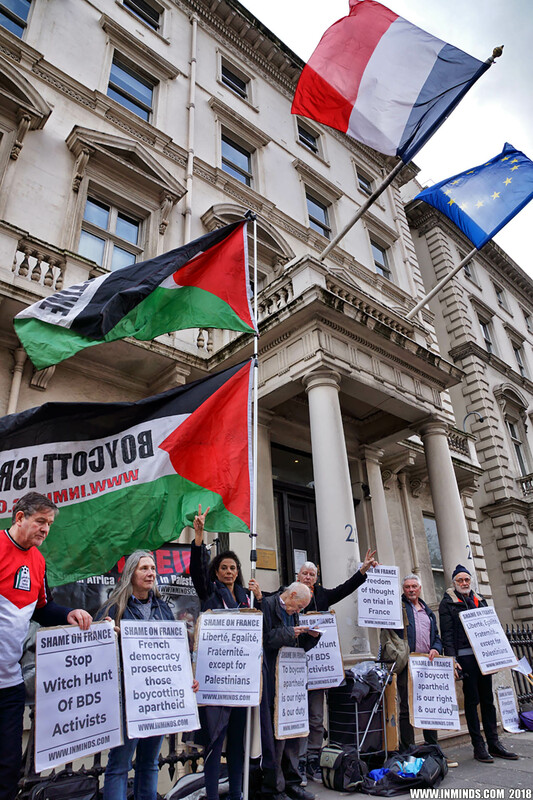 The lobby uses this tactic of lawfare to both intimidate and bankrupt anyone who opposes Israeli war crimes in Palestine. 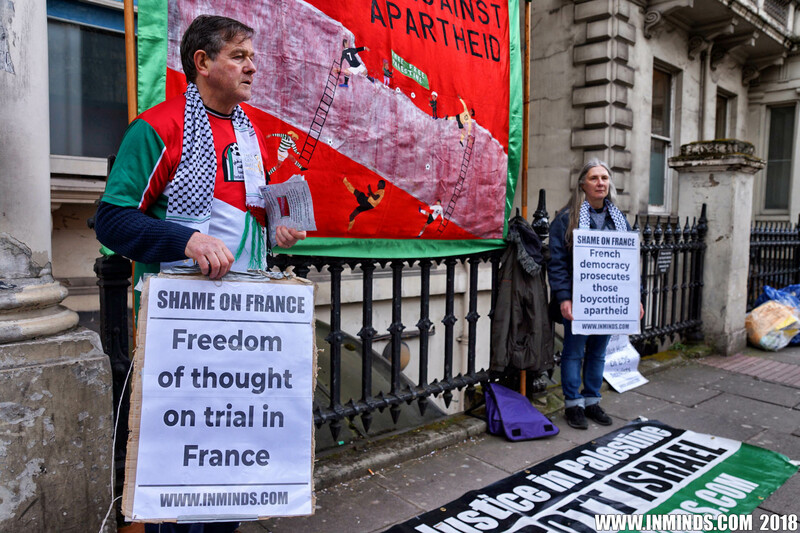 Inminds chair Abbas Ali said "It is shocking that in the 21st century France is carrying out witch hunts against activists who champion human rights in Palestine. 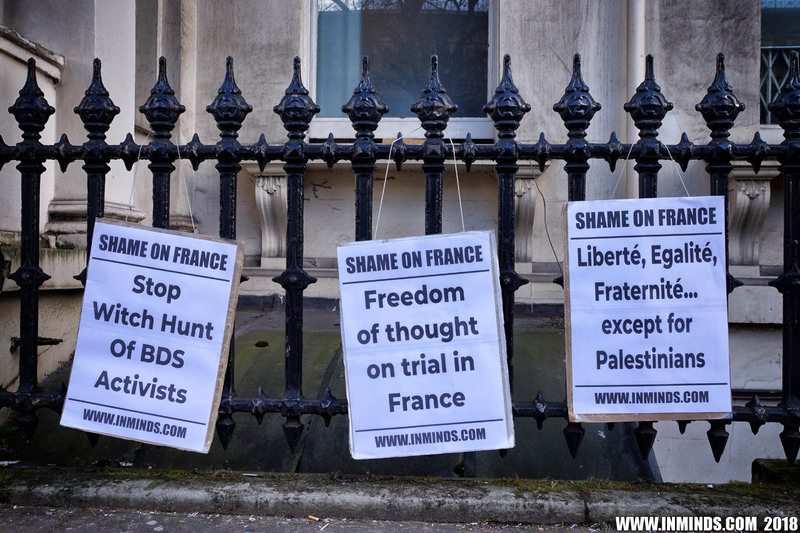 Freedom of thought, freedom of speech, freedom to boycott racism, freedom to stand with the oppressed is on trial in Paris on Monday. 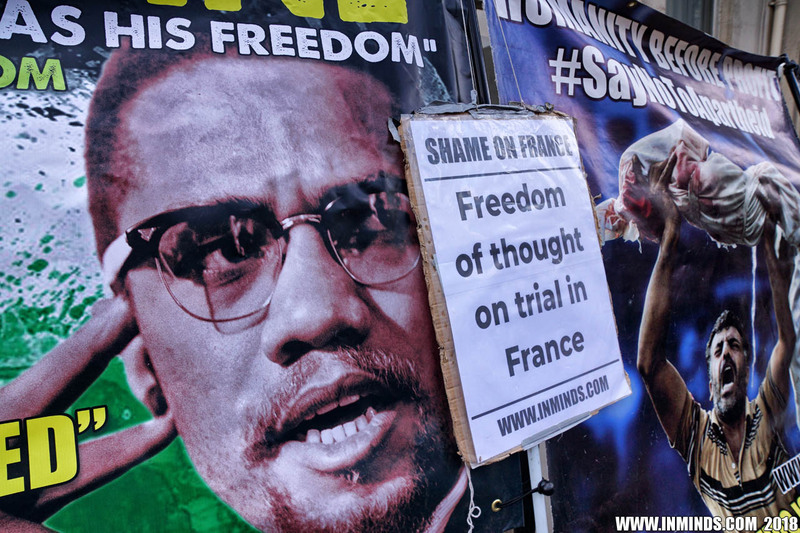 It is imperative that freedom wins. 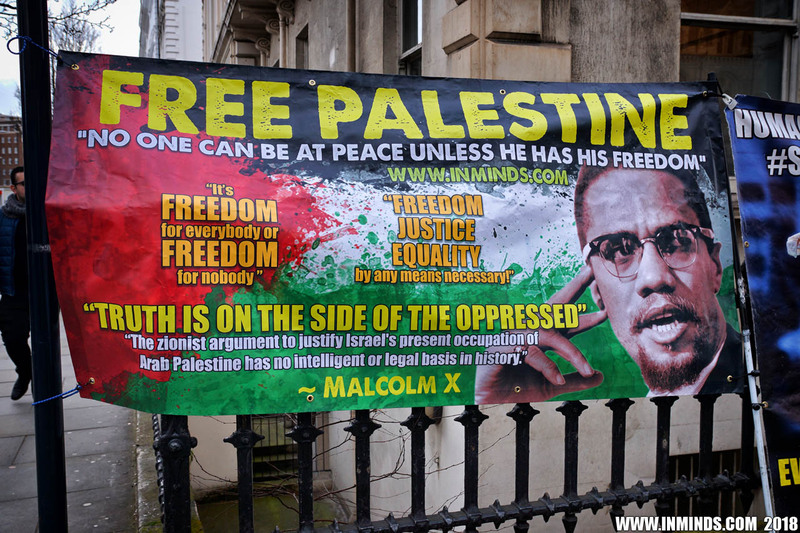 A threat to freedom anywhere is a threat to freedom everywhere. 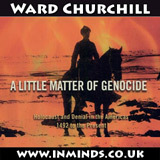 To boycott apartheid is our right and our duty." Over 100 people, many from other countries, attended the protest outside the trial on 19th March 2018. 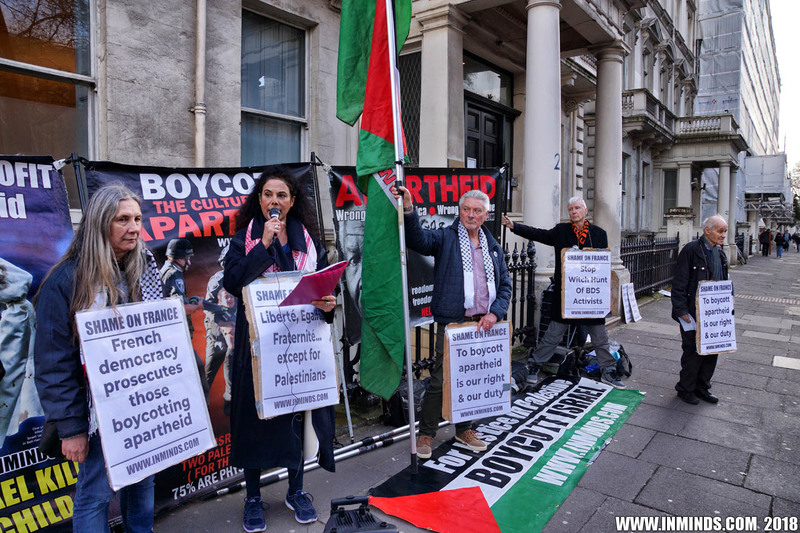 Unbelievably the judge presiding over the trial said at one point that speaking about the torture of Palestinians was itself an "incitement to hatred against the Jewish people." 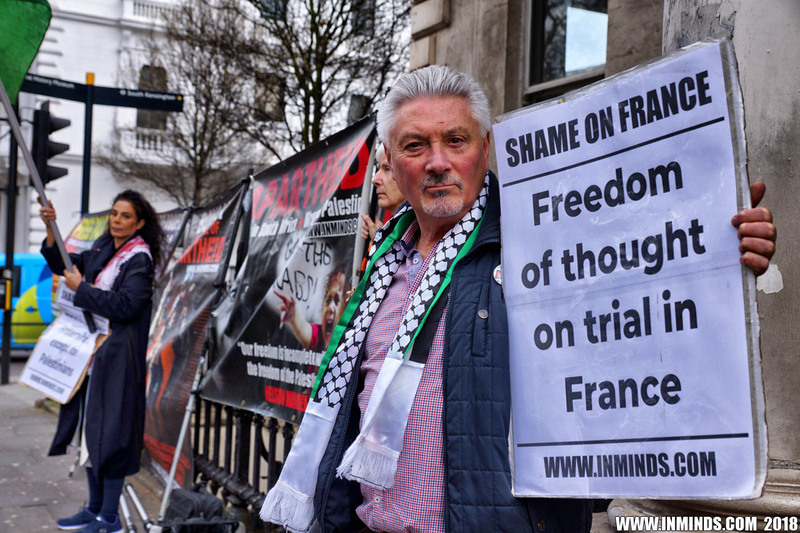 The verdict of the trial will be announced on 14th May 2018. On Friday 16th March 2018, Inminds will protest outside the French Consulate in London to demand France stop its shameful McCarthyite persecution of activists who support a boycott of apartheid Israel.